It had the AfterPay logo at the bottom with the words ‘is now in store’. With Australian household debt the fourth highest in the world, and a net national debt accruing interest of $31,664,835,069, it is clear that many Australians are struggling to get on top of their debt. This however is not a post about finances but rather about irresponsible advertising. The words on the poster have also be used in social media posts. And while some may think that this is funny, the debt crisis and the affects that it has on lives is not as amusing. Financial issues were cited as a factor in more than one in four marriage break-ups, and are considered the top cause of stress which leads to mental health issues such as depression and anxiety. The damage of this snowballs as statistics from Healthline show that 90 percent of people who commit suicide have a mental illness at the time of their death. When you realise the damaging effect that this advertising can have on people, it really is unacceptable. The other concern, is the younger demographic that is being targeted (I’m sure that some of my older readers would have had to Google ‘AF’ to understand what it is referring to). Targeting young, highly vulnerable shoppers like this is outrageous. If they are getting into bad debt habits at a young age, how are they ever supposed to become responsible adult spenders? 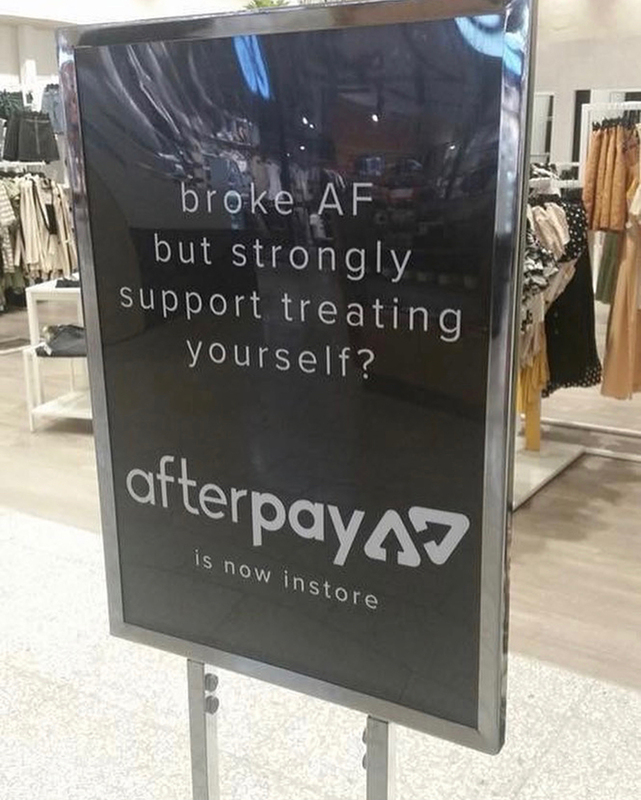 Whether this is a poster created or approved by AfterPay or not, is irrelevant. Their logo is the dominant branding on the poster and is promoting their business. If they have supplied the copy for this poster along with their logo, then they need to take a long hard look at their business values and decide what kind of company they plan to be. If they haven’t endorsed this advertising, they need to reign in what advertising their logo is permitted to appear on. Having an approval policy to determine what advertising is and isn’t allowed to be used will go a long way in protecting their brand against such irresponsible advertising. When the Instragram post went up about the shopping centre poster, a follower commented that it wasn’t an AfterPay advertisement. The problem with this is that another company on Instagram was seen advertising exactly the same wording with the AfterPay logo in the same spot. A quick scroll through Instagram shows that this poster had been shared multiple times by many AfterPay customers. An oversight? I’ll let consumers be the judge. Don’t let your brand be negatively effected by the behaviour of others. If your logo is on any promotional material, you have a say in whether it gets published or printed. If it doesn’t fit into your brand strategy, then you have every right to put your foot down and get it removed. You are currently browsing the Debbie.O Brands blog archives for March, 2018.